As a traveler, I’m very interested with different forms of transportation. I’ve ridden a dromedary in the Sahara Desert, temple-hopped on a horse cart in Bagan, flew over Melbourne on a hot air balloon, crossed Manila Bay on a naval ship to Corregidor. One of the more interesting vessel I’ve been on was the Oberon-class submarine Onslow, which, I suppose does not count on being ridden as it’s docked and is open for tours when you visit the Australia National Maritime Museum in Sydney. Thanks to the U.S. Embassy Manila I can add two more to my list: a helicopter and the USNS Mercy. The USNS Mercy is in the Philippines as part of the Pacific Partnership 2012, a 4-month medical mission that takes them through Indonesia, the Philippines, Vietnam and Cambodia. We met the ship en route to Subic Bay. 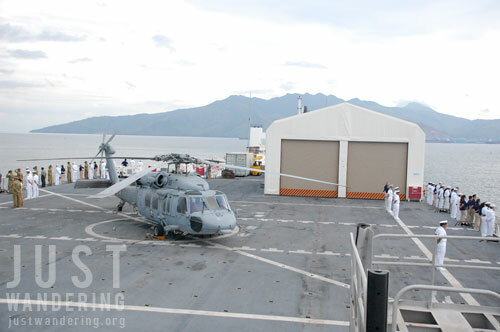 One of the Mercy’s two helicopters picked us up at the Subic Bay International Airport. We were given the safety instructions, which was a little different from the instructions for commercial flights. We had to wear the life vest before boarding, as well as put on helmets with goggles and noise cancelling headphones. Once inside the helicopter, we fumbled with our seat belts — there were 4 straps to buckle together (2 for the lap, 2 for the torso). Lift off was similar to taking off on a hot air balloon: one second you’re on the ground, the next you’re up in the air. The great thing about this ride was that we flew high enough to get a bird’s eye view of the bay and surrounding coastline, yet not too high not to see details of the land and sea below. 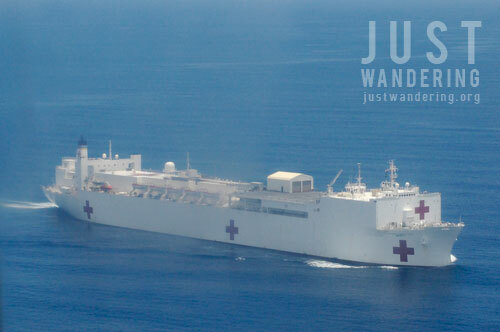 The USNS Mercy as seen from above. For some reason, I keep on thinking that it’s a ship wearing a nurse costume. Thirty minutes after, we see the USNS Mercy. She was a beauty — a huge ship painted all white, save for red crosses on the side, front and top of the ship. There is no way you’ll miss this ship if ever you come across it. 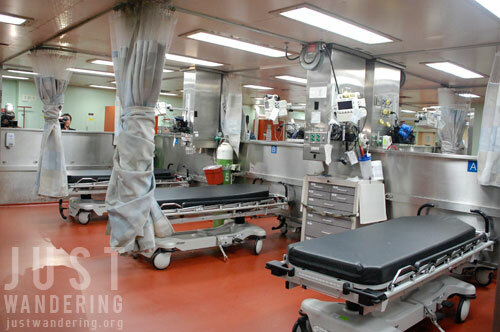 The USNS Mercy was built as an oil tanker prior to it being commission as a floating hospital. It is almost 900 feet long, just a couple of hundred feet short of a Nimitz-class aircraft carrier. It is HUGE. Apart from the gentle sway of the sea and the beds and equipment bolted to the floors and walls, you wouldn’t think you were in a ship. It is really a hospital with operating rooms, x-ray machines, CT scans, pharmacy, and wards with 1,000 beds. Since the crew and volunteers call the USNS Mercy home when they’re on a mission, there are also facilities to keep them entertained during the 4-5 months they’re away. There’s a gym, a den where they can relax and watch TV or movies, and even a post office for sending and receiving letters and packages from home. Just to give you an idea how huge this ship is. About 20% of the ship’s population are Filipinos, most of whom were delighted to have some days off from the ship and meet with family and friends. There are also civilian volunteers from around the world, who are from the NGOs that partnered with the USNS Mercy for the mission. Aside from the medical missions, the USNS Mercy provides medical and surgical services to the US defence force, as well as responds to emergencies brought by disasters. Glad you had an awesome tour of the Mercy! Now you’ll have to catch a tour aboard her East coast counterpart, USNS Comfort. Filipinos still have a large presence in the US Navy, even after they’ve closed the bases in the Philippines, & I think that the Navy probably has the most out of the Armed Forces. Filipinos are definitely well represented. It’s also great to hear that the Navy is doing a lot of humanitarian work too. Do you know what kind of medical work they do in the area? Civic action comprising of medical, surgical and dental services for humans, and vet medicine too Aside from these, they also provide education and support for medical equipment for the clinics in the areas they visit. That is one impressive hospital, I’ve never seen anything like it! PS you can’t beat travel by hot air balloon ;)! 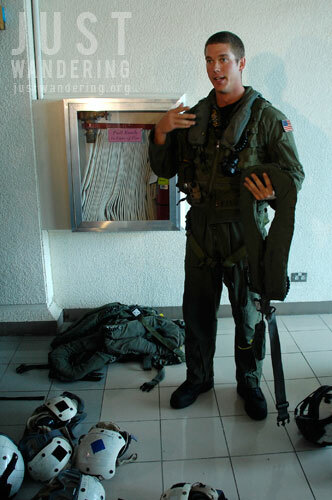 I’d probably do anything to ride a Navy Seahawk. As for the Mercy, it should be on the must-have list of the Philippine military. Not only will it serve wounded servicemen in combat operations throughout our archipelago where it just needs to station itself offshore Also the numerous medical and humanitarian missions it can undertake during disasters or provide service to the most deprived provinces is the best it can function. 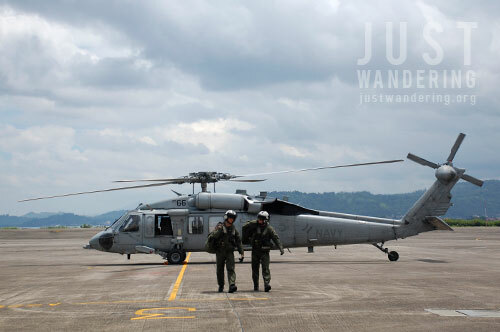 The AFP need not ferry the wounded via a long turbulent ride in a rickety Huey to V. Luna.